Joan B., Illinois sent me an email that contained an article by Ben Stein, entitled We’ve Figured Him Out, [transcribed in this article] written back in July of 2009 that Americans should have paid attention to in election 2012. Some did, but not enough; and because the voting system has become broken, the practice of Democrats using dead people, voting more than once, allowing Black Panthers and Union thugs to intimidate people at voting places, and other voting fraud – Obama won the election. Now, if there are enough honest members in Congress, it will take impeachment to get rid of the imposter …Reports and murmurs of impeachment hearings, but nothing concrete, as Snopes [not objective when it comes to political subjects] points out. The mainstream media certainly won’t be helpful as they were for the Nixon scandal. Will an impeachment hearing have the same results as the Bill Clinton impeachment hearings? How Much More Corruption and Scandalous Acts Will It Take to Do Something? Calling an illegal alien an ‘undocumented immigrant’ is like calling a drug dealer an ‘unlicensed pharmacist’. The latest government screw up in the Obama administration, who has done more to screw things up than any of the last three presidents, has allowed the ICE [Immigrations and Customs Enforcement] to not only NOT enforce immigration laws [as at least three presidents before him], but has directed ICE to go to prisons, find illegal aliens and ask them” Do you qualify for President Obama’s DREAM Act? The last time I looked, that DREAM Act did NOT pass congressional approval. You guessed it – inmates are released if they answer “Yes” to the question.
. You might want to mention that the DREAM Act was issued by executive order and not by Congress. And let’s not forget the boondoggle of the millennium – ObamaCare. Those people in prison are not there because they crossed our border illegally, but are criminals who broke other laws, some violent. You can find your congressional representatives HERE. Your senators HERE. MoonBattery – Daily Caller – main sources. This is not the first time that criminals have been turned loose into various places in the United States. Hillary Rodham Clinton, former Secretary of State who resigned in the midst of a serious scandal in Benghazi that caused, along with the President, the death and injury of Americans serving there is now the recipient of National Constitution Center 2013 Liberty Medal. A slap in the face for those who have suffered from her corrupt career life in politics and the law office she was part of early in her husband’s career, but people like Nancy Pelosi are thrilled. It makes about as much sense as Al Gore and Barack Obama receiving a Nobel Prize. In my youth I was a fan of Mad magazine published by EC Comics. In Issue #60, dated January of 1961, Spy vs. Spy© debuted as a wordless comic strip created by Antonio Prohias, a Cuban cartoonist who faced threats of arrest and execution by the newly ordained communist leader, Fidel Castro. It is the false accusation that Prohias was considered a spy by the Castro regime that initiated the cartoon series. 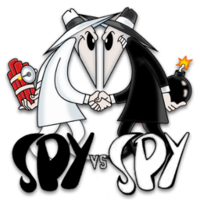 The cartoon depicted one spy dressed in black and another dressed in white constantly trying to do each other in. Fast track to the 1990s when Prohias retired because of his health and died at age 77 in February 1998. The strip continued with writer Duck Edwing and artist Bob Clarke, and in magazine #356 (April 1997), Peter Kuper took over as writer and artist. The characters, including the Grey Spy added in 1962 (female) became a Sunday comic strip released in 2002 and in 2004, the characters were used in television commercials for Mountain Dew soft drink. Milton Bradley produced a Spy vs. Spy board game and video games were produced in three formats, one being Nintendo. In 2005 video games, Red and Blue Spies appeared and between 2006 and 2009 a series was published entitled Spy vs. Spy Jr. depicting spies as children. Of all the scandals floating around Washington, congressional committees busily trying to sort it out, the two most serious are: Benghazi incident and the IRS scandal. The first has to do with the death of Americans serving our country and the other is a well-established and most hated/feared agency in the federal government. The Benghazi tragedy occurred before election day 2012. So it makes me wonder why after all this time why nothing is being done about it. It has been clearly established that the order to “Stand Down” was given more than once, after repeated requests for assistance as three brave men fought off overwhelming odds in terms of numbers and firepower for SEVEN HOURS! – John Stossel [Gas Myths] A Testament that it is government that is cheating Americans, not oil companies … The oil business is fiercely competitive. If one company charges a penny too much, other companies steal its business. Apple’s profit margin is about 24 percent. McDonald’s makes 20 percent. Oil companies make half that. Per gallon, Exxon-Mobil makes about 7 cents. Governments, by contrast, grab about 27 cents per gallon. That’s the average gas tax. If anyone takes too much, it’s government. … Almost no one seems to speak up for a true free market in energy, with competition, innovation and unfettered consumer choice. People say regulation is needed to counter industry ‘greed.’ But if anyone’s greedy here, it’s government — and unlike oil companies, government doesn’t have to work hard and compete to give you good service at the lowest possible price. Government just sits there, telling companies to charge less, telling car companies to make smaller and more dangerous cars, mandating and subsidizing alternative fuels like ethanol — and then telling us that we benefit from the politicians’ efforts. The truth: We rarely benefit. If you were President of the United States, the Commander-in-Chief of US Armed Forces and responsible for embassies and ambassadors around the world, would you put a Las Vegas fund-raiser in more importance than saving US personnel in Benghazi? That is exactly what this pretender to the office of the President of the United States did. He gave the order to “stand down” and went back to bed in order to get rest for his next day fundraiser in Las Vegas, Nevada.